The hand blenders are one of the most widely used kitchen appliance in almost every household. The slim and trim looking hand blenders offer several benefits to enhance your cooking process. You can find a variety of hand blenders from different brands and online stores on DealsCorner. Available on a single platform, it is easy to compare the products and prices offered by the online stores and choose the right product in the lowest price range available in India. The hand blenders gained their popularity starting from Europe with different names like wand blending, stick, and immersion. The name is different, but it is the same stick shaped device which helps in blending different food products. The immersion blenders have a shaft which is immersed in the food for blending. 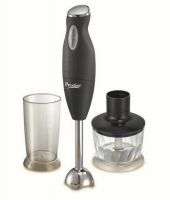 You can find several blenders with interchangeable blades for pureeing and smoothing the food. Most people use the hand blenders for mixing and making sauces, soups, squashing, pureeing, etc. It is very helpful in saucing different vegetables like tomato, garlic, onion, and herbs into the pizza sauce. Using the right attachment for right finish is important in the blending process. The size and capacity of the blenders may differ model to model. Some of the blenders work on 100 watts while you can also find hand blenders with 750 or higher watts. The hand blenders being slim and compact, it is easy to use and clean without any hassle. Most of the hand blenders have two – three speed levels for greater power and faster blending. The shafts used in the blenders are made up of stainless steel and it is less prone to de-colour during the process. 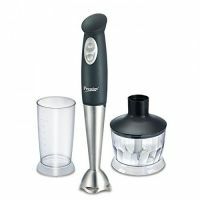 Some of the additional accessories available with most of the handle blenders are whisk, chopper, and alternate blades. The whisks are useful attachments which are majorly used in blending eggs, batters, cream, and similar food. You can also use the chopper which helps in chopping foods in smaller pieces, similar to the food processor. Most of the hand blenders have the facility to attach and detach additional blades by which aerating, chopping and mincing becomes a simple task. 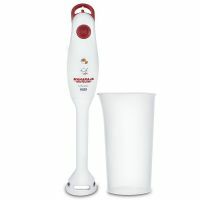 Finding hand blender is a simple task, but finding good quality hand blenders in the reasonable price range is important. You can find hand blenders from any local stores, but most of the local stores have local brands or limited models. 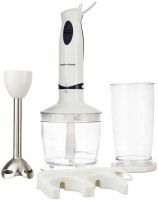 Instead of getting confused by the varying price range of the local stores and brands, take a tour of the hand blender gallery on DealsCorner. You will find products from all major brands and online stores like Flipkart, Snapdeal, Shopclues, Pepperfry, Infibeam, Amazon and many more. Shopping at DealsCorner is simple and easy. We, at DealsCorner, strive to provide you good quality products in the lowest price range available in India. Search the product you need, use the filter options to narrow the search results, compare the prices offered by the various online stores and then choose the product of your interest. Enjoy your shopping and keep posting your reviews.